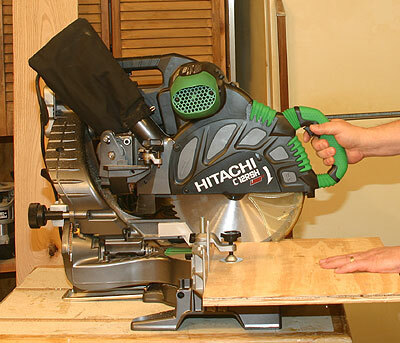 Introduction – Over the last 14+ years, I’ve been using a 10-inch Craftsman Compound Miter Saw. It has served me well. In conjunction with the Craftsman Miter Saw, I had purchased a used Craftsman Radial Arm Saw. Unfortunately the Radial Arm saw had a wobble to it. It was not very accurate. I am guessing the previous owner damaged the saw mechanics. Since that time the sliding miter saw has emerged as a viable tool to replace the regular miter saw and the radial arm saw. With limited workshop space, I am all for replacing two tools with one, as long as convenience is not lost in the process. I started researching sliding miter saws and decided to go with the Makita LS1013F 10-inch Compound Sliding Miter Saw. My priorities included accurate/efficient cuts, quality components, performance, ease of use, dust collection, functionality, size, and price. Read on. Installation – I am not going to go into much detail about installation. If there were problems, I would go into more detail. With the Makita LS1013F Compound Sliding Miter Saw I took it out of the box and plugged it in. I did some initial calibrating and made some test cuts. I also mounted it on a stand and mobile base – sold separately. Everything else was included with the Makita LS1013F Saw to begin woodworking. Quality – If you have read any of my other reviews, you’ll realize quickly that quality of components is very important to me. I am passionate about my tools. The Makita LS1013F 10-inch Compound Sliding Miter Saw did not let me down. The tool feels like a million bucks when you slide it back and forth. The quality is very impressive. The base of the saw is entirely metal. It has exceptionally good balance. It is effortless to use. Accuracy of Cuts—The accuracy of cut was my top priority in purchasing a new sliding miter saw. This is where the Makita LS1013F 10-inch Compound Sliding Miter Saw shines. It is by far the most accurate sliding miter saw that I have used, and that includes the Delta sliding miter. The design is so well balanced that it is effortless to cut wide boards. I have used it to cut hard maple, cherry, oak, and walnut. Dust Collection – The shortcoming of this saw is the dust collection. To be fair to the Makita LS1013F Compound Sliding Miter Saw, I have yet to come across a sliding miter that offers decent dust collection. This saw is no different. Although the dust bag that comes with the saw always seems to be full of sawdust, the truth of that matter is that sawdust ends up everywhere. This gives something for Makita to work on. Functionality – The Makita LS1013F Compound Sliding Miter Saw comes with two enhancements that go beyond the average sliding miter saw. First of all, it has a fluorescent light that you can turn on and off for better lighting. Personally I have not used that much as my shop is well lit. However, if I were working on a DIY project from my garage or a friends place, I could easily see that as a functional feature. Secondly, it comes with a lock down clamp for locking your working piece in place before cutting. You can move the lock down clamp to a number of locations on the saw. Most competitors to the Makita LS1013F Compound Sliding Miter Saw offer the same lock down clamp, but as an additional expense. I appreciate Makita providing the locking down clamp with the saw at no additional fee. Size – It seems that all sliding miter saws require a significant amount of floor space, given the sliding mechanism of the saw. However, some saws, like the Dewalt and Hitachi, require even more space as they are big and bulky. The Makita LS1013F Saw is designed more efficiently and has a smaller footprint than many of its competitors. Although the difference is relatively insignificant from one model to the other, I thought I would mention it. I tend to fight for every inch of space in my small workshop. Performance – The Makita LS1013F Compound Sliding Miter Saw from an accuracy of cut standpoint performs exceptionally well. The direct drive 15 Amp motor is powerful and well-balanced. The motor has never slipped or bogged down. The sliding mechanism is very smooth and sturdy. The base is solid. The handle works well for me compared to other competitor models, as the slider requires the woodworker to push the saw across the base. The Makita LS1013F is effortless to cut boards accurately. The only shortcoming of this saw from a performance standpoint is the dust collection. Conclusion – Great saw. Efficient size and design. Accurate cut. Powerful motor. Lacks good dust collection. I highly recommend the Makita LS1013F Compound Sliding Miter Saw to anyone looking for a well-built, well-balanced and accurate sliding miter saw. Nice saw. Thanx for the detailed review. I believe TWW recently upgraded to the Festool sliding miter. I don’t know if that had to do with his relationship with Festool, or he came across a nice chunk of change. The Festool looks nice – small footprint for a sliding miter. When I picked my “Hitachi 12 SCMS I did so because the sliders are mounted in front of the rear attachment to the base making the distance from the wall a lot less as the sliders don’t have to travel back behind the station. Makita is a good choice too . My needs were a bit different. Bob – if you have limited shop space, the front mounted sliders is definitely something to think about. Thanks for sharing. I agree, the dust collection, from factory, is a joke. But what I did was slip the hose from my festool CT22 to the back after I removed the tiny dust bag, and there was significant improvement. I’ve also seen those “big gulp” dust hoods at rockler. someday when I have the room for a permanent miter saw station, I’ll build that in and plumb it to the dust collector. Interesting ideas. I don’t have a permanent miter saw station either. That was more or less by design. My shop is limited on space, so mobility is key for me. Plus, I may want to haul it outside or to other site locations from time to time. That throws off some of my dust collection options. I have a Jet dust collector with 4-inch pipe, but with the reducer to this saw it just didn’t seem to be pulling enough air to be satisfactory to me. I went back to the dust bag. Sounds like the Festool CT22 is a better design for this type of application. I may have to save my pennies, but I “need” a new bandsaw first. I have been saving up for a good bandsaw. I have 2 of these LS-1013’s and have used them for 8 years. But recently wanted a new one because my old ones are not working with precision anymore. I looked at the new model and did not like how the sliding part worked with the double sections, so I did not buy it. Then the other day I saw the Festool Kapex 120 in a woodworkers shop and loved it. I knew right then I had to have this precision cutting tool, so I went the next day and bought one. Well , today I cut and installed 200’ of 3-1/4” crown molding in 5 hours and the Festool 120 made the work a breeze!. I am so glad I bought this tool and had no reservations on buying it. If you get one be sure to buy the crown extentions also ,they were a big reason why every cut was easy. Now I get to retire my old Makita’s or sell them.